Joining Amerika Now during the first hour is acclaimed author Matthew W. Stewart, who will be discussing his recent book, Nature’s God: The Heretical Origins of the American Republic, long listed for the National Book Award. How well do you understand the ideas and beliefs behind the creation of the modern world’s first secular republic, the United States of America? Many people believe this nation was founded as a Christian nation, but there’s a phrase in the Declaration of Independence that asserts the right of the American people to assume “…the separate and equal station to which the laws of nature and Nature’s God entitle them.” What did the founders mean by Nature’s God? Not only the erudite Thomas Jefferson, the wily and elusive Ben Franklin, and the under appreciated Thomas Paine, but also Ethan Allen, the hero of the Green Mountain Boys, and Thomas Young, the forgotten Founder who kicked off the Boston Tea Party—these radicals who founded America set their sights on a revolution of the mind. Derided as “infidels” and “atheists” in their own time, they wanted to liberate us not just from one king but from the tyranny of supernatural religion. The ideas that inspired them were neither British nor Christian but largely ancient, pagan, and continental: the fecund universe of the Roman poet and philosopher Lucretius, the potent (but non-transcendent) natural divinity of the Dutch heretic Benedict de Spinoza. Drawing deeply on the study of European philosophy, Stewart pursues a genealogy of the philosophical ideas from which America’s revolutionaries drew their inspiration, all scrupulously researched and documented and enlivened with storytelling of the highest order. Along the way, he uncovers the true meanings of “Nature’s God,” “self-evident,” and many other phrases crucial to our understanding of the American experiment, but now widely misunderstood. Stewart’s lucid and passionate investigation will surprise, challenge, enlighten, and entertain you as he spins a true tale and a persuasive, exhilarating argument about the founding principles of American government and the sources of our success in science, medicine and the arts. Matthew Stewart graduated from Princeton and holds a PhD in Philosophy from Oxford University. In addition to Nature’s God, he’s the author of The Courtier and the Heretic and The Management Myth. For more information, visit http://www.mwstewart.com. NO CALLS, THIS SEGMENT WAS PRERECORD. 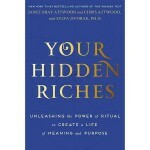 New York Times bestselling author Chris Attwood joins Amerika Now during the second hour to discuss his and co-author Janet Ray Attwood’s latest book, Your Hidden Riches: Unleashing the Power of Ritual to Create a Life of Meaning and Purpose. What do Simon Cowell, Warren Buffett, Brad Pitt, Colin Farrell, Serena Williams and World Cup soccer star Leighton Barnes all have in common? They incorporate rituals into their lives to help them to be at the top of their game! Simon Cowell climbs a tree daily, Warren Buffett plays bridge, Serena Williams bounces the ball exactly 5 times before every serve, Brad Pitt wears a shark-tooth necklace and Leighton Barnes re-ties his shoes before each match. New York Times bestselling authors of The Passion Test, Janet Bray Attwood and Chris Attwood, say that rituals enable anyone to attain the highest level of success in life. They point to athletes who use rituals to perform at their peak, celebrities who use rituals to balance their work and personal life, and even business executives who use rituals to pull a team together to create outstanding results. In their book, Your Hidden Riches – Unleashing the Power of Ritual to Create a Life of Meaning and Purpose, the authors–formerly marriage partners, now eminently successful business partners–show how rituals enable people to tap into their Hidden Riches, those often-undiscovered abilities that open the door for a person’s Unique Life Design. Chris Attwood is an expert in the field of human consciousness and is also deeply grounded in the practical world of business. Over the past 30 years, Chris has been CEO or senior executive of 15 companies including a secondary dealer in government securities, a software developer, several magazines, and one of the leading consulting and training companies in the world. He has sold millions of dollars in consulting and training services to companies like Ford Motor Company, Dell Computer, Sprint, Royal Bank of Canada, Mellon Bank and others. Over the past 10 years he has become one of the leading trainers and authors in the transformational industry, having created programs such as the Enlightened Millionaire Program, co-founded The Passion Test Daily magazine, and the Transformational Magazine Network, putting together some of the major strategic alliances in this industry. He is a founding member of the Transformational Leadership Council along with Jack Canfield, the co-author of The Chicken Soup Series, which includes over 100 of the top speakers, trainers and authors in the world. In addition, Chris is an expert in creating “enlightened alliances,” having played a key role in arranging 70% of the interviews for the movie phenomenon, The Secret. Along with Janet Bray Attwood, Marci Shimoff and Geoff Affleck, Chris mentors aspiring transformational authors and speakers through the Enlightened Bestseller Mastermind Experience. Chris is committed to the experience and expression of the unlimited potential of the heart and mind. It is this commitment that weaves throughout his courses and workshops. CALL 800-259-5791 TO SPEAK WITH CHRIS ATTWOOD. Author Linda Deir joins the show during the final hour to discuss her book, Guided, which is based on her amazing true-life story. From her abusive childhood, business successes and failures, series of husbands/partners, troubled relationships with her daughter and granddaughter and astounding family secrets, Linda has crafted a vivid and inspirational story for open-minded, creative living, and paranormal/spiritual readers. Linda will talk about how she has had the extraordinary and blessed guidance of a host of Spirit Guide Angels, or benevolent beings, in her life from early childhood continuously throughout her life, serving as her best friends and life coaches. Without her guides’ presence, Deir admits that she would have given up and expired long ago. She will detail how these guides have concretely instructed her on how to neutralize the heavy negativity and maximize the wonderful fulfillment in her life. If you are seeking inspiration from a true-life story on how to overcome adversity and live in spiritual awareness, if you are eager to become wiser in your choices with timely input from Source-connected guides, and if you want to live in the bracing truth-filled reality relevant to who you authentically are, then listen in as Linda shares some of the 137 universally applicable Tips, Learnings, Lessons, and Awarenesses received directly from her life-long relationship with her spirit guides. Guided is a road map for stepping on board at any point along your life path to join forces with your own spirit guides to create a better life than you could have on your own. In addition to writing, Linda Deir is a speaker, life coach, intuitive counselor, and dream interpreter. She teaches individuals how to connect with their own spirit guides. Linda currently resides in Sedona, Arizona, and lives a guided life with her husband, Ray, and their cat, Benny. For more information, visit http://lindadeir.com/. CALL 800-259-5791 TO SPEAK WITH LINDA DEIR.